A last minute change in plans meant I got to attend the Homespun Yarn Party. And I picked up a few things. 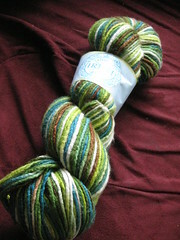 From Three Irish Girls - Wexford Merino Silk in Aiden. 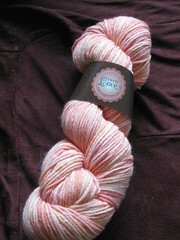 From the Yarn Love side of the table, Charlotte Bronte Worsted in Sweet Tangerine. 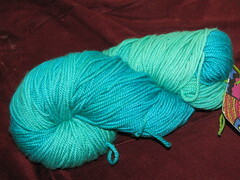 From Woolarina, Lux Sock in a yummy oceanic type colorway. 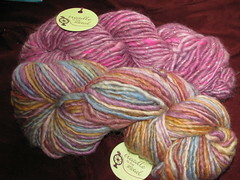 And from Treadle to the Metal, some yummy handspun in Iced Hibiscus and Lavender Sunset. And people said the good stufff would be gone by the time I got there. Mwa-ha-ha.